A Pima County park located on the southeast side and named for a historic Southern Pacific Railroad stop will open on Wednesday, May 3. The 274-acre Esmond Station Regional Park will serve Vail and Rita Ranch area residents, offering a walking trail, five separate fitness stations with exercise equipment, and a ramada. “These amenities are just the first phase of a much larger plan to provide robust recreation opportunities for county and city residents alike in this growing region,” District 4 Supervisor Steve Christy said. The 2004 voter-approved bonds funded the land acquisition for the “Southeast Community Park” as well as a master plan that calls for a library, sheriff’s substation, multiple softball and baseball fields, soccer fields, dog park, swimming facility, tennis courts, and the Esmond Station historic area – which will be developed in the future as funding becomes available. The park is located near Empire High School on Mary Ann Cleveland Way, east of Houghton Road. The park’s ties to the railroad run deep. Several historic buildings in the area were part of the Esmond Station stop, which was constructed in the 1880’s as a stop along the Southern Pacific rail line through southern Arizona. Esmond Station became notorious in 1903 when a deadly train wreck occurred near what is now Houghton Road. Two trains collided head-on causing a fiery derailment that killed more than a dozen and injured many more. 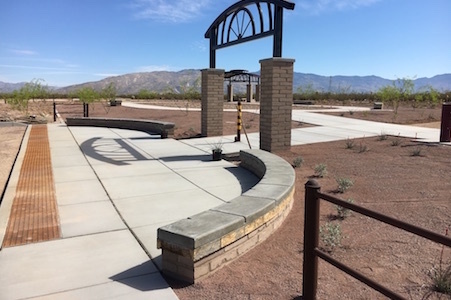 The park also features a one-mile long segment of the old Southern Pacific rail bed, the adobe Crew Quarters building, and foundations associated with other historic structures.